2019 is said to be the year of thank you, next and the only beef anyone should crave for is one that doesn’t involve drama. Medium rare, perhaps? It’s easy to dismiss steak to be a dish only the wealthy can enjoy on regular days, but, alas, fancy food doesn’t always have to cost a fortune. Thankfully, Manila has become home to havens where expensive food is made affordable. Unlike its cooking option, reasonably-priced steakhouses in the metro aren’t rare. A leader in serving thick grilled cuts of good beef, Gudo lives up to its name as they’re out to satisfy not just your cravings on steak, but your chicken and pasta appetite as well. 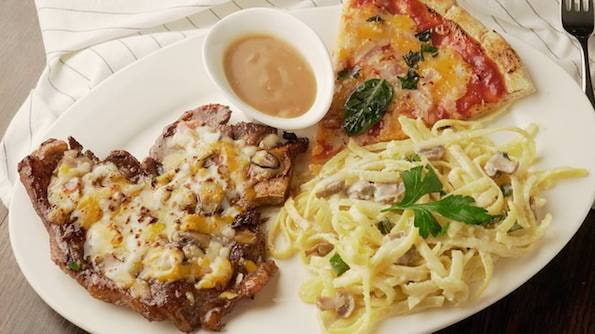 With noodle favorites all below P200 and a variety of thin crust pizzas that are mostly in the 100-peso range, this by-the-road restaurant proves to be the perfect place for barkada gatherings and family celebrations. 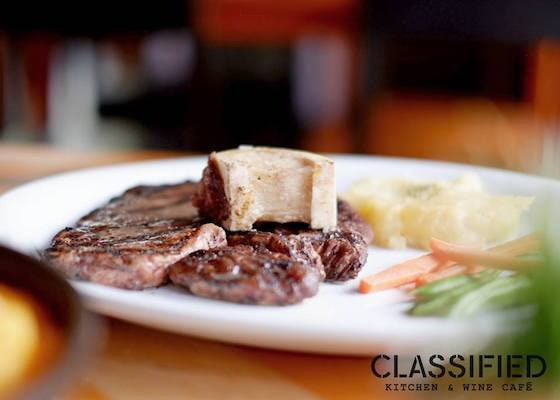 At P205, guests can also choose whether to pair their flavorsome T-bone steak with white steamed rice or mashed potato. If you’re determined to feast on an extensive selection of carbs and a meaty main to top it all off, let Gudo be the place for you. 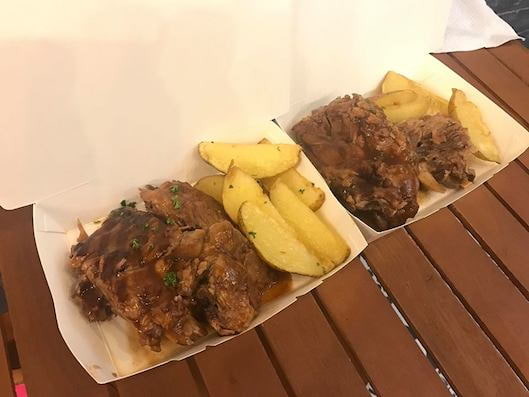 One of the newer restaurants on the list, Steak Fix differs from its contemporaries in that it lets customers create their own steak platters. 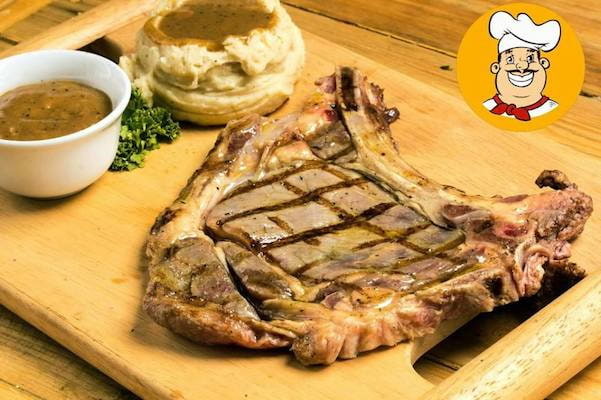 A regular meal consists of a T-bone steak and a side of your choice, although the portions and number of sides can be customized according to your liking. Diners can partner their meat with pesto or alfredo pasta, a slice of pizza Margherita, mushroom cheese scramble, mashed potato with corn, or rice. One of their best sellers is the bacon mushroom T-bone melt – grilled to your preference and topped with a fusion of pork bits and soft shrooms; it’s understandable why people flock to this newbie and load up on protein. Prices start at P199. An incredibly strong challenger in the world of chunky beef, Steak and Destroy is here to conquer. Popular mostly to Iskos and Iskas, this hole-in-the-wall found in UP Diliman’s Area 2 triumphs significantly in taste and price. 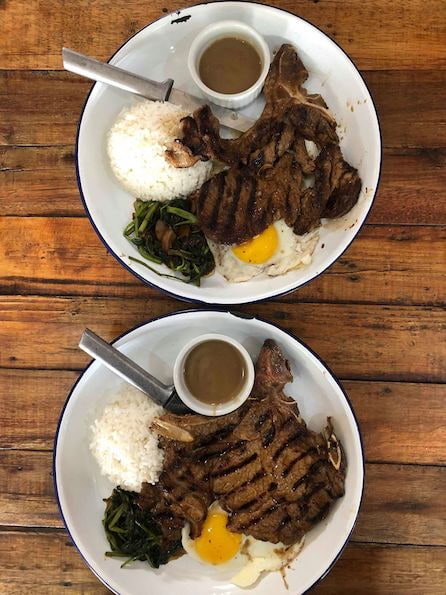 For only P155, diners are blessed to experience their T-bone steak served with a sunny side up, garlic kangkong (or water spinach if you’re feeling fancy), a cup of white rice, and gravy. Other crowd favorites include their pan-grilled chicken, sausage, and omelets. If you’re around the area, dismissing this promising eatery would be a crime. Another leading contestant in the steaks and wings category would have to be Griddle Steak X Wings. With a branch right in the heart of Maginhawa, this travel-themed casual diner continues to take one of the top spots because of their tasty treats and budget-friendliness. Made just the way you like it, Griddle steaks are rich in flavor and thrive in tenderness. Available with the side of your choice and the sauce that you desire, the prices begin at P199. Beef aside, they also serve rice bowls, pasta, dessert, and a selection of chicken dishes. If you’ve never had Australian T-bone steak, then now’s your chance, mate. 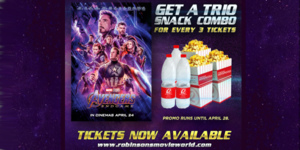 Partnered with unlimited rice for only P295, this Filipino-Aussie combo will make you want to perform a slow-mo twirl after every bite. Cozy and quaint, customers will be delighted to know that this Tomas Morato charmer serves unlimited red wine from Monday through Thursdays, too. Undeniably a fancy force to reckon with, this chef-owned restaurant is also home to many sugar rushers, coffee lovers, and pasta fans. If you fancy a beer or two with your steak, Ribs and Steaks by Darya is at your service. 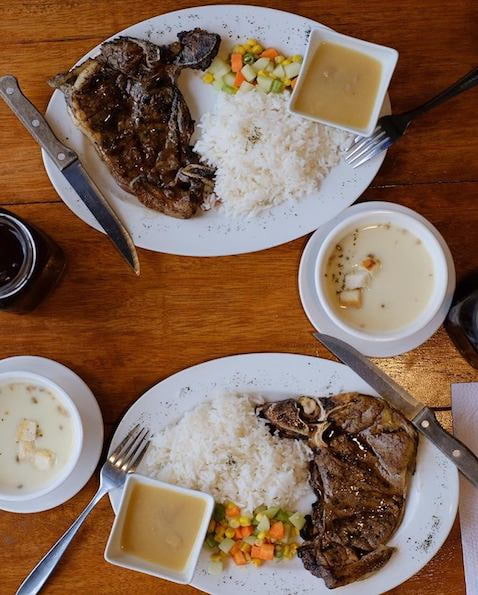 With a T-bone steak pegged only at P155 and a porterhouse steak at P175, you can indulge in beefy goodness at rates that don’t ruin your budget. If you’re looking for a unique twist in flavor, opt for their Burgundy wine sauce for that special kick. Should you crave for more, their shawarmas and kebabs fill you just right, too. If you frequent the Katipunan area, drop by with your friends and grab yourselves a bucket of booze while munching on affordable grilled greatness. While it’s difficult to remain faithful to only one steakhouse, Steak To One might just make it easier for you. 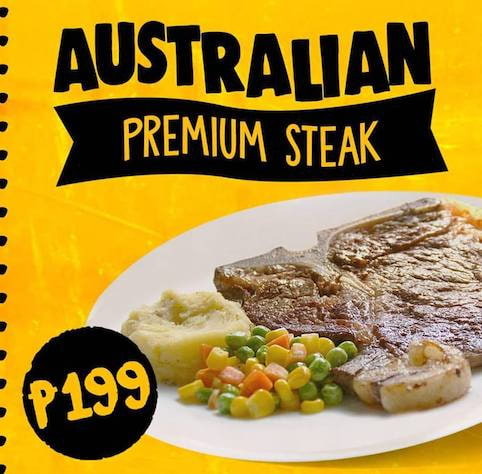 For just P168, customers get to enjoy a T-bone steak with two sides and their preferred sauce. If that’s not enough for you, their ribeye, porterhouse, and filet mignon also do gastronomical wonders for only P280! If you’re down for a little extra something, their baked cheesy shrimp and Tuyo pasta offer something new to the palate, too. What’s more, their bestsellers also come in party trays, so you can show up confident with beef at your next bring-your-own-food party. 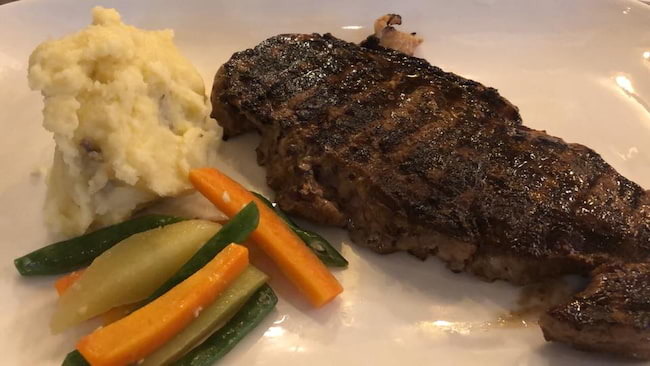 One of the more sophisticated-looking steakhouses in the metro, Blake’s Wings & Steaks is an American diner that’s a sure treat not only for one’s taste buds but also for one’s eyes. This laid back, rustic-themed restaurant provides a stomach-filling sanctuary for bloggers and Instagram junkies alike. 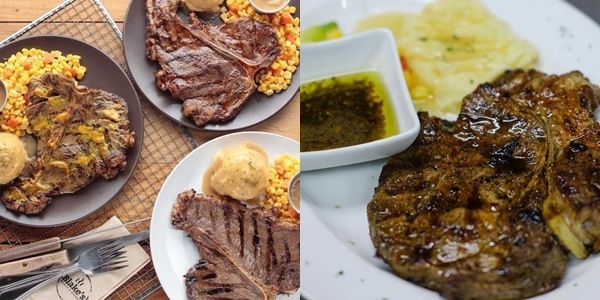 Priced at P275, guests can choose what flavor they want their T-bone steak to be: original, hickory bbq, or honey mustard. For only P20 more, diners can also snag an even more gratifying porterhouse steak! Aside from beef, this Katipunan stunner also offers sandwiches, desserts, and – as the restaurant name gives away – chicken wings. If you’re in the mood for more than just steak, Fat Russel’s Kitchen can help you with that. Aside from restaurant staples such as seafood, chicken, and burgers, this urban-looking beauty serves lamb steak and salads, too. Interestingly, one of the many dishes they’re known for is their lengua (cow’s tongue). Their beverage menu is just as extensive as their dishes, too, as they also have a fun array of cocktails and fizzy sodas to boot. If you’re one who’s out to satisfy only you’re cravings for steak, their T-bone is priced at P290, and their Angus beef belly is P230. Another “fatty” on the list is Fat cousins. 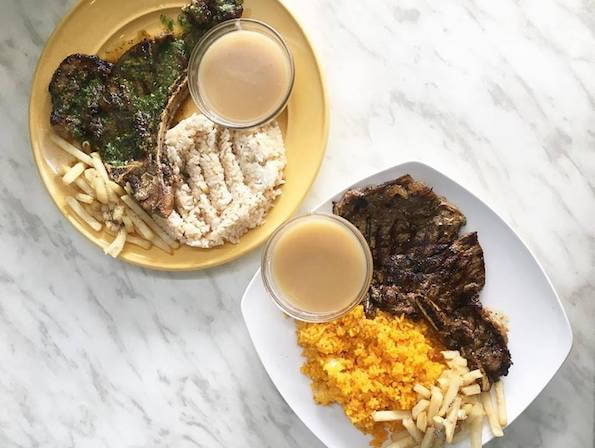 Famous for their milkshakes and sweet treats, diners will be happy to know that for only P199, one can down a plate of Australian premium steak with a bowl of soup and unlimited rice. 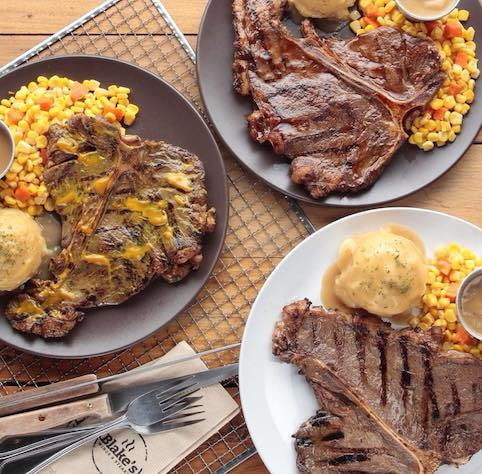 Their premium rib eye steak is just as affordable at P229, too. Other great choices in their menu are their Hungarian sausage, baby back ribs, and roast beef – all served with unlimited rice, as well. To cap an exciting meal, consider ordering their massive serving of a soda float. Among the many restaurants in Maginhawa, a worthy contender is Grill of Thrones. 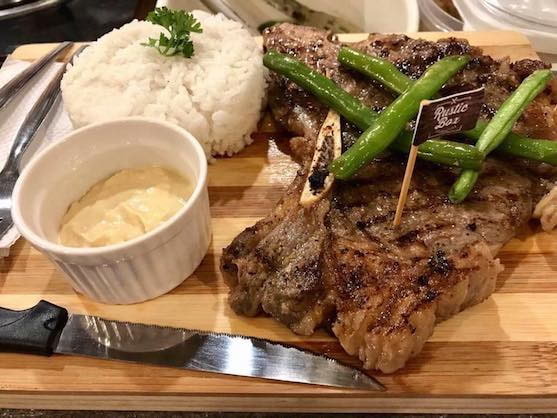 Known primarily for delivering great food in large quantities, this cute Maginhawa restaurant confidently dabbles in serving our favorite beef-grilling, too. You can gobble their House Steak of Winterfell for only P190. Cleverly named after HBO’s Game of Thrones, customers can opt for their Lannisterific Liempo, Dracarys Flaming Hot Dinakdakan, and Jon Snow’s Rise From The Dead Ribs, too. Ordered mostly in party trays, another must-try for first-timers has got to be their Bagnet. Contrary to their “Dinner is coming” tagline they’re open from 11 AM to 10 PM every day. One of the more well-known steakhouses in the country, Rustic Box Steakhouse offers the goods at prices that might just be as friendly as your favorite neighbor. 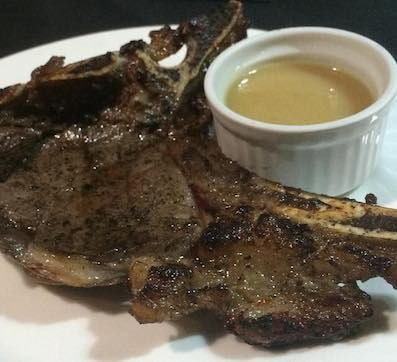 For quality meat, customers can devour a T-bone at P220, and ribeye, and porter steak at P275 each. And while their premium beef cuts are to die for, they serve salmon, blue marlin, and rice toppings to-go, too. 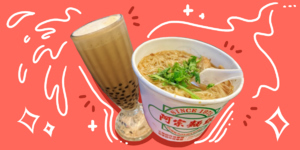 Those on a budget will be happy to know that they also have several treats and dishes that are just as filling but are below the P200 bracket.